Milan walking tour inclusions: Our private Milan walking tours includes entrance fees to the sites you will visit and the services of a licensed Milan tour guide. 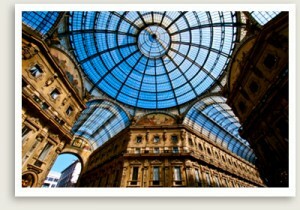 Enjoy a private tour of the fashionable city of Milan with a private expert tour guide. This tour features the art and architecture of Milan. This Milan private tour starts with a walk in the city to view the city’s main sites like the opera house (La Scala) and a beautiful covered shopping gallery (Galleria Vittorio Emanuele II) and a visit inside Milan’a cathedral (duomo). After your Milan private tour ends, you will be well situated to continue to explore this magnificent city on your own and do some world-class shopping. The Sforza castle now houses several of Milan’s finest museums and art collections, including the Brera Gallery, which you will visit. This gallery is home to some of the most important works from such Italian masters as Bellini, Tintoretto and Caravaggio. Your tour guide in Milan will take you on a guided tour of some of the most intriguing and well-known masterpieces housed here.